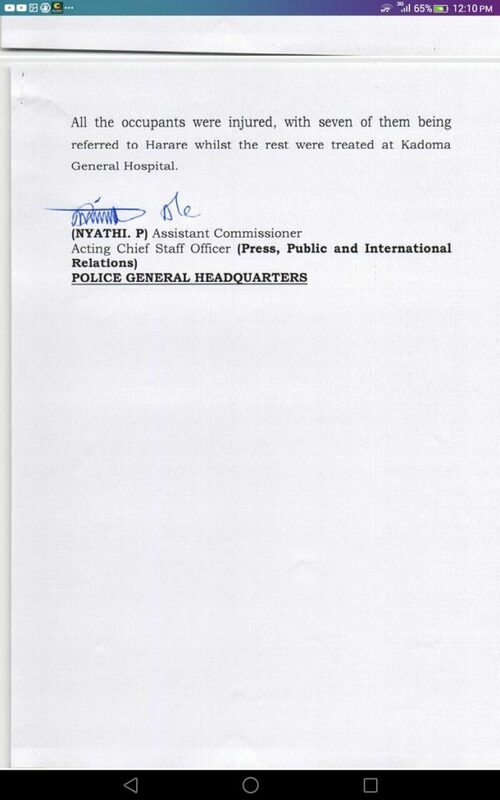 The Zimbabwe Republic Police has released a statement on the Trip Trans Bus that was swept away while trying to cross a flooded bridge. The incident happened on 15 March 2019 before the worst of the floods had started. INCIDENT INVOLVING A TRIP TRANS BUS IN CHIMANIMANI AND A ROAD TRAFFIC ACCIDENT INVOLVING A CAG BUS IN KADOMA. The Zimbabwe Republic Police is urging motorists to be cautious as the nation braces for the impact of cyclone IDAI in some parts of the country. 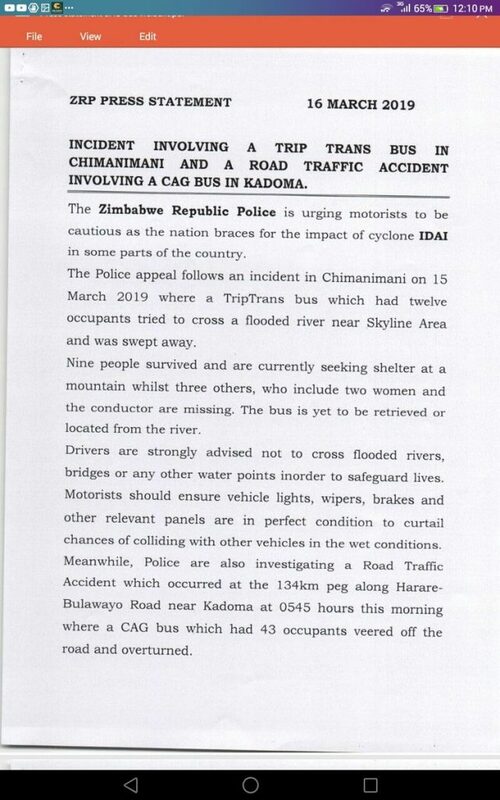 The Police appeal follows an incident in Chimanimani on 15 March 2019 where a TripTrans bus which had twelve occupants tried to cross a flooded river near Skyline Area and was swept away. Nine people survived and are currently seeking shelter at a mountain whilst three others, who include two women and the conductor are missing. The bus is yet to be retrieved or located from the river. Drivers are strongly advised not to cross flooded rivers, bridges or any other water points inorder to safeguard lives. Motorists should ensure vehicle lights, wipers, brakes and other relevant panels are in perfect condition to curtail chances of colliding with other vehicles in the wet conditions. Meanwhile, Police are also investigating a Road Traffic Accident which occurred at the 134km peg along Harare-Bulawayo Road near Kadoma at 0545 hours this morning where a CAG bus which had 43 occupants veered off the road and overturned.